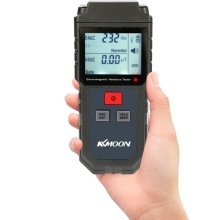 This detector can test electric field radiation and magnetic field emission to reach the optimal test result. It&apos;s widely used to test and learn electromagnetic radiation situation indoor and outdoor. One detector with two uses, it can test the electric field and the magnetic field radiation at the same time. When the test result exceeds the safe value, the instrument will alarm automatically. Data hold and clear LCD display, one-key can lock the radiation value and easily read the value. Radiation assessment can remind you whether the radiation value is safe. Easy to use and operate, easy to move or for on-site measurements. Electromagnetic radiation monitoring: household and appartment, office, outdoor and industrial site. Electromagnetic radiation test: mobile phone, computer, TV set, refrigerator and high voltage cable radiation test. Radiation protection product test: test effects of radiation-proof clothes, radiation-proof film and other prevention articles. Equipped with a built-in electromagnetic radiation sensor, which can display the radiation value on the clear LCD digital display after processing by control micro-chip.